This is a list of the 50 U.S. states, territories, and U.S. Census Bureau divisions and regions ordered by population density. 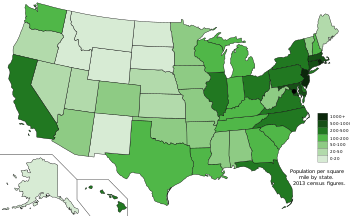 This data is from the 2013 estimate of population by the United States Census Bureau. Puerto Rico 3,615,086 3,424 1,055.9 Terr. U.S. Virgin Islands 106,405 134 792.2 Terr. Guam 159,358 210 759.6 Terr. American Samoa 55,519 76 726.1 Terr. Islands 53,883 182 295.5 Terr. States by population -- JULY 2005 . United States Census Bureau. September 29, 2006. GCT-PH1-R. Population, Housing Units, Area, and Density: 2000. United States Census Bureau. Last accessed September 29, 2006.